I'm excited to share my recent travel adventure. It's not everyday that I leave the city and explore the best of the 7,107 islands of my country. Over the past years, I've explored the beaches in the islands of Boracay and Batangas. I'm happy to report that I've reached another island. Palawan made it to my list of dream fulfilled. A short plane ride will take you to Palawan. 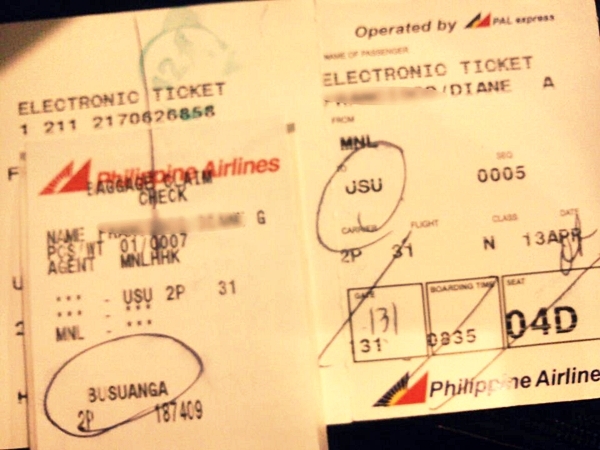 We were booked via Philippine Airlines (PAL), my first time. I'm loyal to Cebu Pacific for all my economy flights. However, when I stepped in PAL's plane I felt the obvious difference. PAL is just way better in so many aspects. I lost count on how many times I rode this motorboat while in Palawan. We spent another hour in the middle of the sea. We were transported to our home over the last four days. We were literally housed in the middle of the sea! I believe 90% of the entire place was made from the sturdiest local wood. Rooms were adjoined by a wooden bridge. This spot looks perfect even during the early morning when it's low tide. I wake up with this view everyday. Since the curtains are always blown away by the strong wind, the owners stitched some sea shells to keep it in place. I spent most of the my time here. Another interesting piece, a rocking chair made of thick and heavy wood. I will never forget Kubo sa Dagat. It's so far the most unique vacation house I've been. How could I forget sleeping in a house in the middle of the sea. The gentle flow of the water beneath each wooden tile was soothing and refreshing. Summer air may not be that conducive, but the entire view of the sea and the mountain ranges compensates. Despite having an all Filipino vibe, I discovered that Kubo sa Dagat have gained significant number of clients from European countries, mostly French and Spanish. Aside from the serene and unique experience, Kubo sa Dagat offers meals that complement the taste and preferences of Westerners. Upon asking some colleagues who arranged our trip, an overnight stay in the Kubo amounts to Php 3,000 (around $75) a night. It may look expensive but the entire package includes the room, complete meals (breakfast, lunch and dinner) and airport transfers. Kubo sa Dagat also offers other activities such as island hopping, snorkeling and kayaking. In our case, we were fortunate to receive discounted rates and free consumption of all amenities. In case any of you will become interested in trying Kubo sa Dagat, here are some tips that can hopefully make your best experience. Bring additional supply of food for snacks. Pack some chips and biscuits for your gastronomic survival. As you can see, the place is in the middle of the sea and snacks are not included in their package. Avail of the island hopping adventure that comes in a little hefty price of Php 1,500 (around $37.5). Be sure that you are equipped with all your toiletries, though the house provides few sachets of shampoo and soap. They also provide bath towels that can be changed on a daily basis. You just have to personally approach their staff. Aside from your sunscreen protection, also bring mosquito repellant lotion. I had my own share of minor insect bites during my last night. Lastly, be sure that all your gadgets are fully charged before you move in the Kubo. They have solar powered electricity but the staff tend to regulate the consumption. There's only one outlet to charge all electronic devices. i went to palawan last january... paradise!! Indeed! Did you blog about your experience? Consider it in your list Leah :) Thanks for dropping by. I just found your blog and love your writing! I love to travel but I am home bound for a time, so love to see and hear of your adventures. I feel I am ready to put Palawan down as my next relaxing holiday. What an adventure and such a beautiful and relaxing place. Love that rocking chair, the sweet curtains with the shells, and of course your beautiful view. What a fabulous place to visit. I would be right where I love to be in that beautiful room! I'm so glad you got to travel there and share photos with us. I mentioned you on my blog this morning! Sweet hugs my friend and namemate! refreshing! :D looks great. sana makapunta din kami ASAP.